I must say that I have been completely sucked into the Diamond Giveaway. I can’t remember if I bought a pack of 2010 Topps last year, but if I did, I never got a Million Card Giveaway code, so I did not participate in the “Transmogrifier,” whatever that is. Like I said, I’m hooked worse than riding the white horse. The only problem is I have painted myself into a corner. As I will eventually share, Crinkly Wrappers provided a HUGE chunk of my Want List. I went from needing 227 cards down to a mere 60. This is where the problem lies, I am now less likely to buy packs of cards. 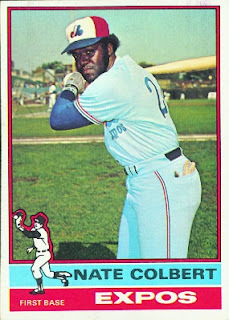 Needing only 60 cards to complete Series One means it is easily attainable to do strictly through trades. When one trades, one doesn’t buy packs. If one doesn’t buy packs, one doesn’t get Diamond Giveaway Codes. Oh, the irony. Please don’t take this as a statement that I’m not grateful beyond measure as to Crinkly Wrappers assistance. But now I’m like a junkie who can’t score his blow. I did some quick math, and since I need only 60 cards, the odds of me pulling a card I need are low. As we all know, Series One has 12 cards per standard pack at $1.99. We can all reasonably assume that two of those cards are not base, so that leaves 10 cards per pack. Since I already have 270 base cards, that means the next pack I buy, on average, will yield 1.8 cards that I need. As that progresses, the odds get worse and worse and worse. You see, I’m on a strict budget (self induced) and I can’t go throwing $2 bucks around to get two cards. This is where Topps makes their money. I’m sure they fiscally, secretly despise traders, but they know there will be some collector who spends exorbitant amounts of money chasing those last 60 cards. Anyways, I’ve gone six days without buying a pack, and I feel that monkey slipping, but EVERY time I log onto the Giveaway, I have the tingle in my blood. That little voice saying, “Come on. It’s two bucks. You could get a Code Card. DO IT!” Just like when I quit smoking, I get up and walk outside. So, to make the Giveaway entertaining with my three virtual cards, I’ve gone on a quest. Much similar to Play at the Plate’s MCG idea, I am on a Diamond Mining Adventure. I’ve decided to take my 1977 Rod Gilbreath and 2002 A.J. 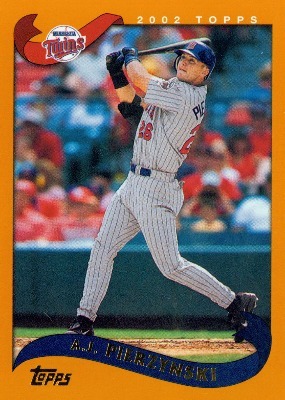 Pierzynski, and turn them into the oldest card possible. I’m not combining the cards to get one card. I’m going one for one as far back as I can go. How has it gone so far? Painfully slow. After four days of extremely reasonable offers, I finally took a step forwards, I mean backwards. 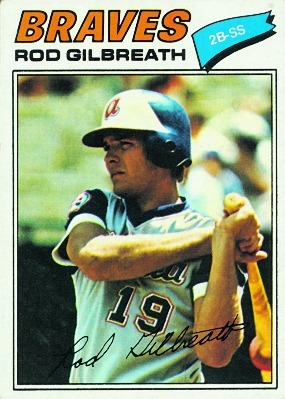 Rod Gilbreath became a 1976 Nate Colbert, one of my all time favorite players. This trade shocked me, but I am elated. Next, old A.J. had been giving me fits. 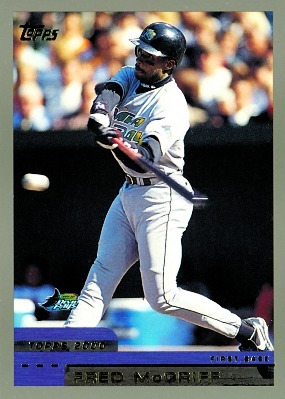 I was completely underselling him for any 2001 nobody. No bites. Then I thought I’d go for a star. Not a superstar, but a star nonetheless. And voila, it worked in less than 15 minutes! A.J. morphed into a 2001 Fred McGriff and then immediately into a 2000 Fred McGriff. Not bad, in my opinion. So, after six days, I’ve mined backwards one year for one card and two years for the other. Who knows what I'll do with that Jair Jurrjens Diamond Die Cut. I’ve got until December 31st, so who knows what will happen. 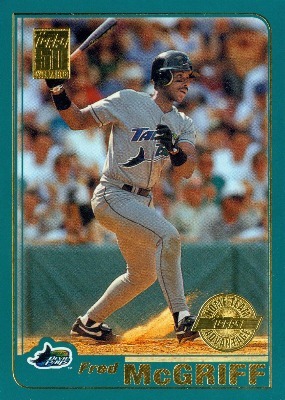 Finally, the moral of the story is: If someone offers you a 2000 common for a 1999 common, you may be making my day!